Sited on a natural plateau within a valley that focuses over a bay, this house is an asymmetric “C“ in plan. The house is set out around a central living pavilion pealing off to private bedrooms and opening toward an inner courtyard to provide shelter from wind and weather. There was a requirement by local council for a high level of camouflage within the landscape. To achieve this, deep eaves were integrated to create shadow over the glass, limiting reflections of the glazing as well as enabling the house to nestle into the landscape and enjoy the associated passive solar benefits.The lounge pavilion provides a frame from which to view the water in the distance and enjoy the shade and breeze. The roof pitch slopes inward to the courtyard to maximize sun and light. Bathrooms open directly on to Kanuka and Manuka forest. 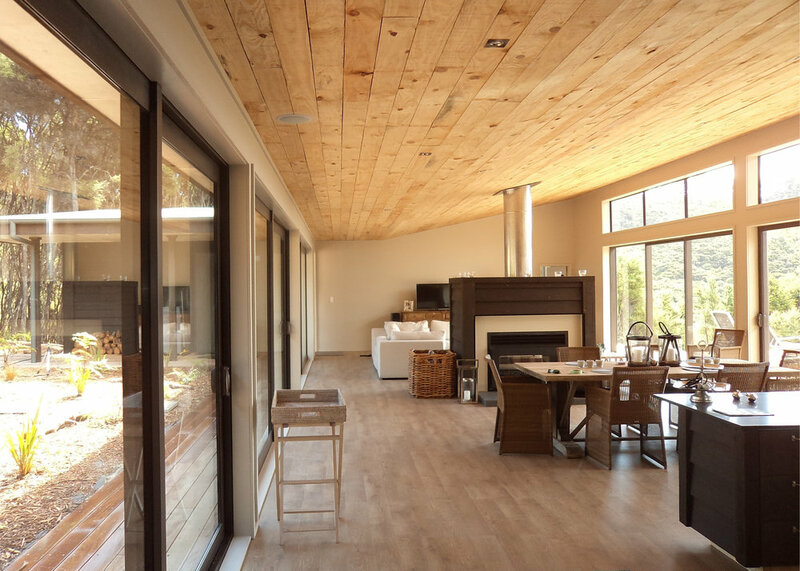 Materials and finishes were deliberately selected to invoke the clients vision of a rustic primitive hut. Economy was critically important when building on Kawau Island, as materials had to be barged over. Concrete in some instances had to be delivered by helicopter and the builders lived on site five days a week, working from early to dusk.